When Joseph Smith was creating his religion there were times in which he was required to explain his basic beliefs, teachings, and claims. In one such case, Smith was asked by a newspaper editor, John Wentworth, to provide an outline of his own important life events, stories, and beliefs. 1. The members of the Godhead – We believe in God the Father; His Son, Jesus Christ; and the Holy Ghost. 2. We will be punished only for our own sins – Men will be punished only for their own sins and not for Adam’s transgression. 3. All may be saved through the Atonement of Jesus Christ – That through Christ’s Atonement, we can be saved by obedience to the laws and ordinances of the gospel. 4. The first principles and ordinances of the gospel – That faith in Jesus Christ, repentance, baptism by immersion, confirmation, and receiving the gift of the Holy Ghost are all necessary for salvation. 5. The need for and the nature of authority in the ministry – That leaders and teachers in the Church must be chosen and ordained by priesthood power. 6. Church organization – That Christ’s Church today is organized as it was when He first established it. 7. Spiritual gifts – In modern-day revelation and priesthood healing and blessing. 8. Scripture – That the Bible and Book of Mormon are both divinely revealed scripture. 9. Continuing revelation – That God has communicated with and will continue to communicate with humankind. 10. The gathering of Israel – In the literal gathering of Israel and the restoration of the ten tribes, and that Zion will be built on the American continent when Christ reigns on the earth. 11. Religious freedom – In worshipping God according to our own dictates and allowing others to do likewise. 12. Obedience to law – In sustaining the laws and leaders of the land. Mormons believe that these articles outline the very heart of the Mormon faith. However, they also suggest that they aren’t comprehensive. 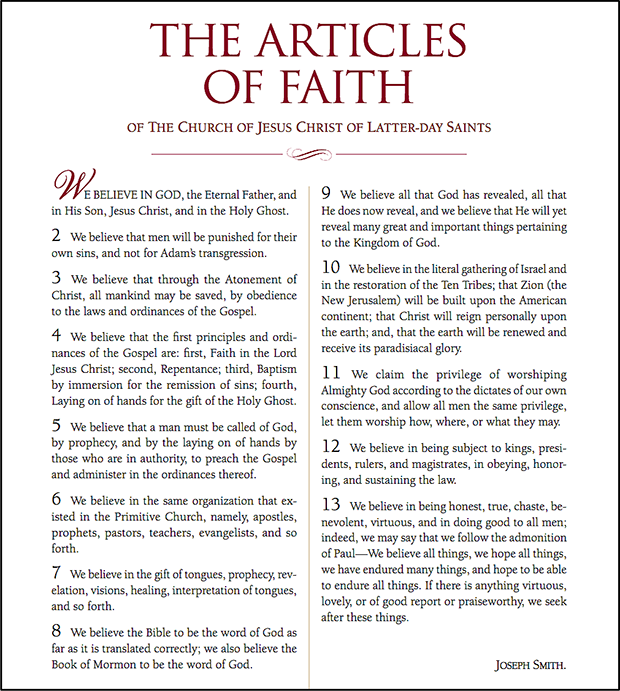 Mormons further believe that the Articles of Faith serve several important functions, hence why Mormons encourage their fellow believers to memorize them. Their most obvious function is to provide a solid outline of the Mormon religion to unfamiliar outsiders who ask them questions about their beliefs and practices. They also serve an apologetic function as they enable Mormons to defend their beliefs, what they perceive to be core gospel principles, as well as God’s revelation to Joseph Smith. The Articles of Faith, like Smith’s other writings in the Pearl of Great Price, are deemed divinely inspired. 1. The Church of Jesus Christ of Latter Day Saints. Articles of Faith. Available.